This is an unusual site where toilets seats and toilet tanks were dumped years ago. And amazingly, these structures make ideal homes for lobsters, so many locals dive into the big toilet to catch their prey at opening night. Photographed near Redondo Beach Submarine Canyon with a Nikonos IV, a 15 mm lens and one Ikelite Sub Strobe. 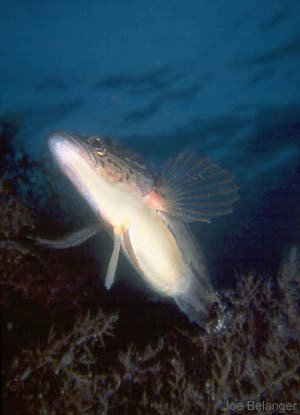 Photographed at Casino Point, Catalina Island using a 35 mm lens set at f11 with one small Ikelite Sub Strobe M.
About the Kelpfish: Found frequently hiding in seaweeds and algae. They are difficult to photograph unless you know their seasonal habits. Spring is easier to photograph these guys because they are too busy guarding their nests, thus they don't usually swim away. Range from British Columbia to California. Size to 2' (.66 m). Photographed at Santa Barabra Island at the rookery. This sealion kept mimicking me. As I blew bubbles, so did it. I was lucky enough to capture the little cutie blowing bubbles at me. Exposed at f8. I used a Nikonos V and 15mm lens with dual Ikelite Substrobes; a 150 and an Ai. 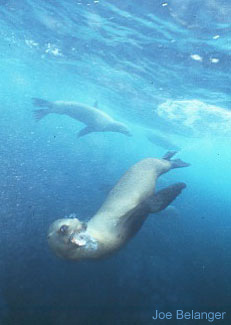 About the Sealion: These animals of circus fame abound in Southern California and around the world and are real characters in the water. Photographed at Ship Rock using a Nikonos V and 15 mm lens. Exposed at f8 at one foot. 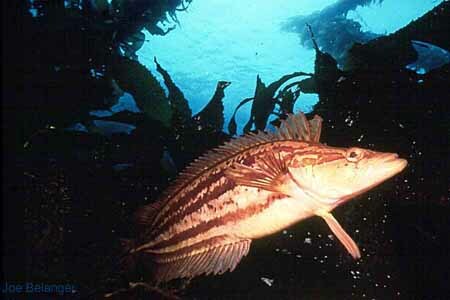 About the Giant Kelp Fish: Found among rocks and in seaweeds and within kelp. 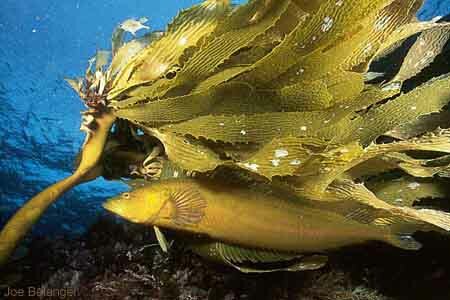 Here a kelp fish protects its nest. They range in size to two feet and feed on crustaceans, mollusks, and small fishes. Photographed at Catalina Island in shallow water using a Nikonos V with a 15mm lens and two Ikelite Substrobes (one 150 and one Ai). 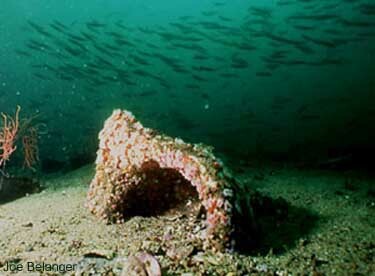 About the Kelp Fish: Found usually within kelp and algae. This guy was blending in with the fronds on this palm kelp, as a form of cryptic adaptation (blending in). They range in size to two feet and feed on crustaceans, mollusks, and small fishes.